When I picked up the phone one evening just over ten years ago one of the last people I expected to hear on the other end was my magician friend Scott Wolf. It’s very possible you’ve seen him before. A video of one of his magic routines gone horribly wrong went viral on YouTube and was seen by millions more on TV. I was in the audience a few years prior to his phone call when Scott set his entire head on fire. Not on purpose. But because he deceived himself into assuming that playing with fire—even as a seasoned and highly trained fire-breathing magician who had performed the dangerous stunt countless times—would never result in severe burns over his entire face. I’d seen him perform the trick flawlessly many times before. I say “trick” but it’s no trick in the sense that it wasn’t real fire or any real danger. Scott’s fire breathing act is dangerous and, yes, it is real fire. Holding a blazing torch in one hand and two others not yet set aflame, he opens his mouth, sticks his tongue out and touches it with the ignited torch. Then, with his tongue on fire, he sets the other two torches aflame. Repeatedly blowing out and reigniting the torches with his mouth, with no apparent harm, Scott has duly petrified the audience. But he’s just getting warmed up, if you’ll excuse the pun. Then, in an explosive conclusion, Scott chugs a couple of ounces of lighter fluid, holds one of the flaming torches at arm’s length and blows a massive ball of fire the size of a couch into the air. But the night of the accident Scott got a little careless, lighting up his face and head like a six foot candle. Frantically patting his face in a vain attempt to extinguish the flames, he ran off stage while the audience gasped in stunned horror. I was the first to reach Scott offstage. I found him face down in the stage right wing, the fire now extinguished. His first words were, “I can’t believe I did that.” After having seen Scott turn himself into a human torch just seconds earlier, I was relieved that he was able to speak at all. He was rushed to a nearby hospital and, after several painful procedures over the next few weeks, made a dramatic and full recovery. A few years later Scott began touring with a large illusion show. Although in his younger days he had abused alcohol and drugs, he’d been clean for several years and was determined to keep it that way. But with the boredom of life on the road and little accountability Scott let his guard down and the deceptive thought, I can handle it, gained a foothold in his resolve and soon his old habits returned. After being forced to leave the tour due to his substance abuse, Scott moved to Alaska where his downward spiral accelerated, sucking him into a seemingly hopeless life of meth and cocaine addiction. It was at that point that he picked up the phone and called me. I hadn’t seen Scott in quite some time, so he filled me in on his descent into drug-fueled deception. For a second time he had played with fire. And for a second time he was burned badly. This time not only physically, but emotionally and spiritually. Scott happily agreed. I called Teen Challenge and told them Scott couldn’t afford their program but he desperately needed them. They agreed to accept him and, true to his word, Scott stepped off the plane and into a new life. His years-long road to recovery was not without its stumbles, but today Scott is the Outreach Coordinator of a Teen Challenge Center in the Pacific Northwest along with his wife Charity who is the Executive Director. By God’s grace and Scott’s determination, a magician who himself was badly deceived now helps men find their way out of the darkness of deception by introducing them to the light of God’s forgiveness and healing. 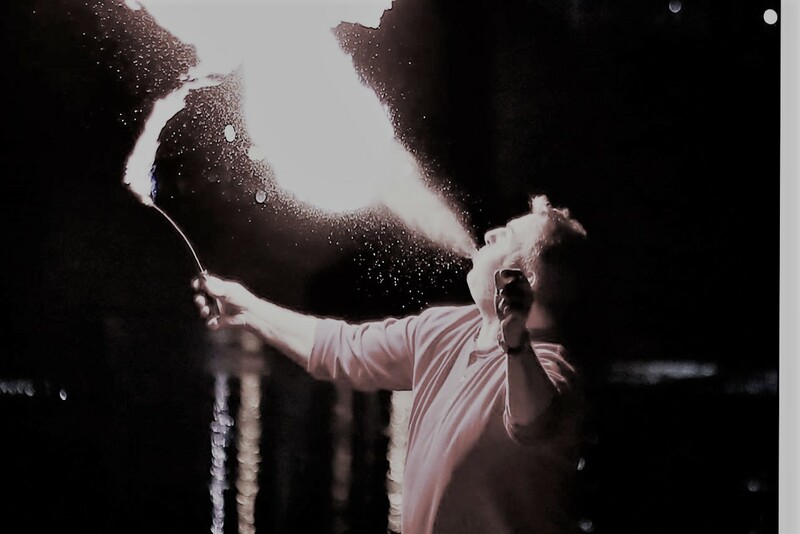 And, yes, he still “breathes” fire on stage as a dramatic punctuation to his amazing illusion show, during which he shares his personal struggles and victories, inspiring others in need of hope. Rod Robison is a mentalist, magician, author and speaker who helps companies and organizations create unforgettable events for their employees and clients. This article is adapted from his book: Unmasking the Masquerade: Three Illusionists Investigate Deception, Fear, and the Supernatural.